What Says ‘Pop Culture’ More Than Waffle Taco? We all know that McDonald’s is breakfast king in North America; but I love when another savvy competitor comes along and they show their moxy. A few years ago Tim Horton’s went guns blazing after McDonald’s breakfast sandwich market and McDonald’s fired back and launched McCafe. Tim Horton’s has recently introduced hash browns to their menu and so the war carries on. The latest fast food giant throwing their hat into the ring kind of surprised me a little… Taco Bell! 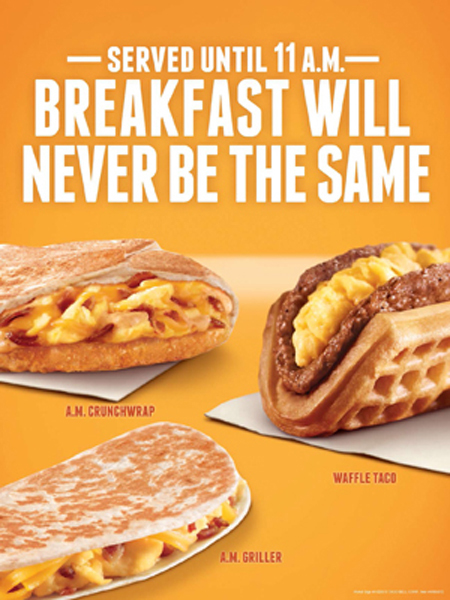 In a few weeks, U.S. Taco Bell stores will launch a new breakfast menu as well as open stores earlier in the morning. Are you ready for the Waffle Taco? They will also offer an ‘AM Crunchwrap’, a ‘Bacon and Egg Burrito’ and last but not least the ‘Sausage Flatbread Melt’ – a cheese covered sausage patty wrapped in a flatbread then grill pressed… that actually sounds pretty good I hate to admit. But their aspirations didn’t stop there; Taco bell also plans on adding coffee to their menu at the same time. So I guess it is no surprise that Starbucks announced they will be launching their new breakfast sandwiches this week. McDonald’s already has the Breakfast Burrito… so I am guessing McQuesadilla is not far away? Speaking of Quesadillas… Taco Bell is also launching the ‘Quesarito’; take a burrito and wrap it lovingly inside a quesadilla and there you go. Put back a few of these bad boys and you’ll run for something, I’m not sure it’s the border though. This entry was posted in Writing and tagged Breakfast war, McDonald's, Starbucks, Taco Bell, Waffle Taco. Bookmark the permalink.